BOSTON – They could have declined the penalties and opted to skate 5-on-5. They could have simply handed the puck over to the Boston Bruins on every faceoff, rather than attempt to win possession. Either option would have been a more honorable choice than the putrid displays on the power play and in the faceoff dot for the Blackhawks in their Game 3 loss to the Bruins on Monday night. The score was 2-0; the disparity in those areas was significantly starker. “You can talk about [faceoffs] and our power play. Those were basically the differentials in the game,” said Coach Joel Quenneville. The faceoff picture was particularly gruesome. After losing in the dot in Game 1 by just a 51-49-percent margin and Game 2 by a 54-to-46-percent count, Game 3 saw the Boston Bruins win 71 percent of their faceoffs, going 40-for-56. Patrice Bergeron, considered the best faceoff man in hockey, was 24-of-28 in the dot. Dave Bolland and Michal Handzus – two of the Blackhawks’ faceoff aces – were a combined 1-for-18. “Definitely something that we take a lot of pride in and we talk about a lot, and we have some really good centermen. It’s not just about the four centers. It’s about everyone on the ice chipping in and helping to win those battles,” said Bergeron. The Blackhawks love to possess the puck. When they do, good things happen. When they don’t, they allow the Boston Bruins to carry the play, set the tone, pin them inside their own zone like a voodoo doll. The pathetic display on faceoffs was an invitation for the Bruins to dominate the game. The shot attempt differential that was so stark in previous games was cut down to just 56-51 in favor of Chicago. What happened on the draw in Game 3? "I don't know, you tell me," said Jonathan Toews. These were all new headaches for Chicago. The constant lingering migraine of their postseason remains the power play. The Blackhawks are now 0-for-11 on the power play vs. the Bruins, who have killed at least the last 25 power plays they’ve faced. They had four shots on goal in 8:11 of power play time, two of them from Patrick Sharp, who was the only Blackhawk to resemble a threat on the man advantage. “They box you out. They got big bodies. They blocked shots. I think we had some chances to get some pucks through the net, we didn't. Our entries weren't great. That's something you want to look at,” said Coach Joel Quenneville. There’s obviously a lot of credit to be given to the Boston Bruins penalty kill. Frankly, I thought special teams would be a wash, but it’s become apparent that the Blackhawks need an extra goal here or there on the power play to win this series. So their deficiencies are glaring right now. Patrick Kane has played over 10 minutes on the power play through three games and has one shot on goal. Duncan Keith has manned the point on the power play for over 10 minutes through three games has hasn’t hit the net with a single shot. There's no creativity, no pressure. It's two minutes of rink-length laps to collect the puck and try, try again. “We gotta have that mentality that it’s 5-on-5 out there. Guys without the puck maybe aren’t supporting the guy with the puck enough. We’re just kind of watching him, and we’re ganging up on him,” said Toews. 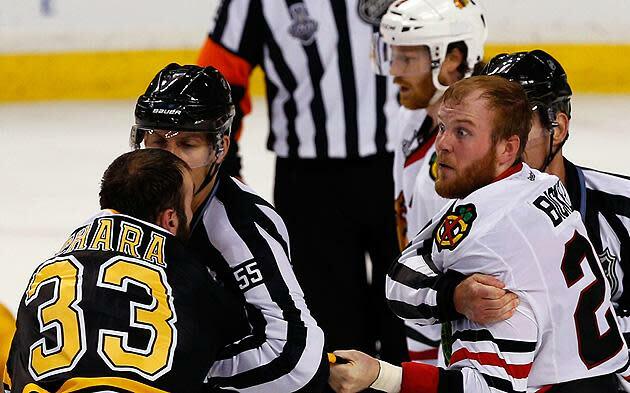 The Blackhawks paid plenty of lip service to the power play before Game 3. About speed. About playing it with a mindset of 5-on-5 hockey. About Rask and the PK not being in their heads. It was all talk. The actions spoke volumes. They have zero confidence on the power play, and their coaches have no answers. The lack of confidence spreads into even strength play. Not to make Kane a punching bag here, but was there a single moment in Game 3 that better defined the Blackhawks in this series than Kane getting a cross-ice feed and hesitating on his shot until Rask gobbled it up easily – in contrast with Daniel Paille’s immediate blast that gave the Bruins the lead? Quenneville’s teams are frequently lauded for doing the little things right. They defend well, transition well, control the puck and know their roles. The problem for the Blackhawks is that they know their roles a little too well right now, when the solution may be the unleash the fury offensively. How many times to we have to hear Jonathan Toews repeat this mantra, as he did after Game 3? Yes, Toews should be celebrated for shutting down Parise and Koivu and D’ing up Zetterberg and playing well defensively against the Krejci line, which didn’t generate a point in Game 3. All of that is great if you’re Dave Bolland or Chris Kelly. This is Jonathan Toews. And while Patrice Bergeron – the player against whom he’s often compared – is a plus-4 with seven goals in 19 games, Toews has one goal in 20 games. While we patently wait for the ret-conning of this postseason performance with the revelation of some sort of injury, know that the captain of the Blackhawks has fewer goals in the 2013 playoffs than Brent Seabrook and Michal Handzus.